It was great to work for Ken Fulk Design again for an extensive BarMitzvah installation at the Regency Center in San Francisco. Downstairs, in the ballroom, a frame tent structure was lined with a Celeste-Blue gold star lining with multicolored drapes. 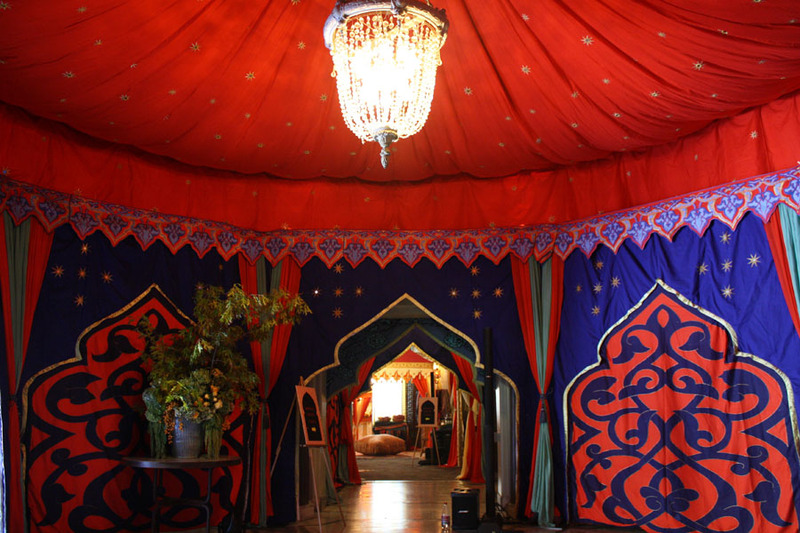 On each side there were Pergolas set up as Kasbah vendor, entertainment, lounge and bar booths. Corridors were framed and decorated with Raj Tents Mughal Arch walls leading to a smaller ballroom set with multiple Pergolas. Upstairs in the fabulous Masonic Lodge, Mughal Arches backdrops to the buffets and furniture around the dance floor carried the theme through. Our favorite part was the Flame Red Gold Star print custom canopy made to go around the large iron chandelier in the Regency Center’s atrium. Many thanks to Billy Picture who pulled all the logistics together!